Poly Vinyl Chloride (PVC) is one of the most common and earliest plastics being manufactured since the 1930s. 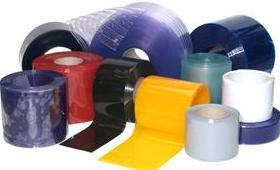 This plastic offers many different applications being cost effective and can be recycled. This plastic has been studied intensively to guarantee its safety. The compound of PVC granules are manufactured by mixing plasticizers and PVC resin with specific additives to combine flexibility, stability and other required qualities. We then extrude the composite to form into strips and sheets to our specifactions. Our manufacturing facilities have wide experience in the process of manufacturing PVC compounds and extrusion of high tolerance pvc rolls.